A specific gene fragment probe for Southern blot based hybridization of genomic DNA. The GeneProberTM is available unlabeled for radioactive based methods and labeled with digoxigenin for chemiluminescent detection. One tube is supplied containing 500 ng of the lyophilized unlabeled GeneProberTM probe. The quantity supplied is sufficient for at least 5 random prime labeling reactions using 100 ng for each reaction. Gene Link recommends using 25 ng of probe for each labeling reaction. The digoxigenin labeled probe supplied is sufficient for five 20 x 20 blots. 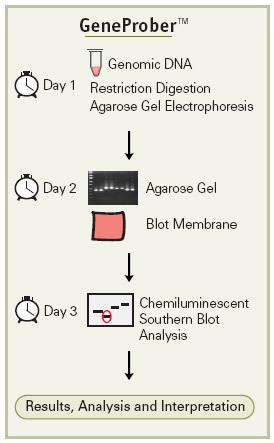 The GeneProberTM product line is based on the chemiluminescent Southern blot detection method. These probes are specially developed to detect the triple repeat amplifications. Fragile X, Huntington disease, Myotonic dystrophy, Friedreich&apos;s ataxia and Kennedy disease GeneProberTM unlabeled and digoxigenin labeled are available. Gene Link&apos;s non-radioactive detection systems for genotyping of triple repeat disorders are rapid, reliable and as sensitive as the 32P labeled southern blots. No more decayed probes and radioactive exposure. A detailed manual accompanies the product giving a step by step protocol, results and interpretation guidelines. Fragile X CGG repeats genotyping results using Gene Link&apos;s GeneProberTM products. Fragile X GeneProberTM GLFXDig1 Digoxigenin-labeled Probe (Catalog No. 40-2004-41) and GeneProberTM GLFX1 Unlabeled Probe (Catalog No. 40-2004-40) were used to probe human blood genomic DNA digested with Eco RI and Eag I. Left blot was hybridized with digoxigenin labeled probe and processed for chemiluminescent detection. 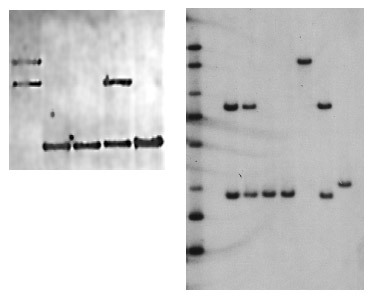 The blot on the right was hybridized with 32P labeled GLFX1 and processed for radioactive Southern blot detection. Both blots were exposed overnight to X-ray films. Normal fragment sizes for females are between 2.8 kb and 5.2 kb, and a single fragment of 2.8 kb in males. The blot shows samples with CGG repeats in the affected range. Fragile X, Huntington Disease, Myotonic Dystrophy, Friedreich&apos;s Ataxia and Kennedy Disease GeneProberTM unlabeled probe. 500 ng 40-20XX-40 Click here to order! Fragile X, Huntington Disease, Myotonic Dystrophy, Friedreich&apos;s Ataxia and Kennedy Disease GeneProberTM digoxigenin labeled probe. 110 µl 40-20XX-41 Click here to order!